(in IDEA 12.1.3) I notice that when creating a File > New Project > Java Module, then there is different behaviour if I type the module name in first, followed by the project name, as opposed to when I do the opposite. Now the project structure of the last case (Project First, Module last) makes most sense (see screenshot), but it appears a bit unfortunate that the .idea file isn't immediately visible in IDEA's project browser (see screenshot), like it is in the first case where it's path gets set to the same as that of the module. Is this a bug? Am I meant to manually add the .idea folder to the project's files? 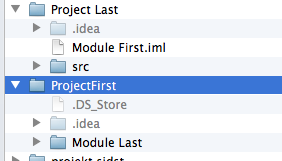 .idea folder should be under a module content root to make it possible to share project settings via source control. So, the secong case exposes a bug. .idea folder should be visible in Project View if it is located under content root. That makes it clear. Thank you. Sorry, I was wrong. .idea does contain internal internal settings, but since it can be shared via source control, it should be located under content root (and be visible in project view). So, the bug is in the first case (editing project name first). I will correct the wrong answers above. hmm .. while this gets the .idea folder into the Project Tool Window (by virtue of being under the content root of the default module), It also breaks the hiearachical seperation of a Project being composed of modules, doesn't it? If the .idea folder literally is part of the initial default module in this way, doesn't that blur two otherwise separate concepts - project and module? level only, conceptual problem remains.